The survey finds that a majority of officers favor the use of body cameras by police officers. About half think that wearing body cameras will make police more likely to act appropriately. But just one-third of officers think that it would make the public more likely to cooperate with the police. Despite the national attention given to training and reforms aimed at preventing the use of unnecessary force, relatively few (half or less than half of rank-and-file officers) report having had at least four hours of training in some key areas over the past 12 months. For example, half of rank-and-file officers say, over the past year, they have had at least four hours of training in nonlethal methods to control a combative or threatening individual, and 46% say they have had at least four hours of training on how to deal with individuals who are having a mental health crisis. The survey also asked officers their views on how useful several different approaches of policing are today. A majority of police say that requiring officers to show respect, concern and fairness when dealing with the public is very useful. But less than half of those who view this as a very or somewhat useful approach say that their department’s leadership provides a great deal of support to officers who want to do so. A narrow majority of officers say that patrolling high-crime areas is very useful in policing today. About three-in-ten officers (32%) who view this as a useful strategy say their leadership gives a great deal of support to officers who want to take this approach. A majority (66%) of officers favor the use of body cameras by police. Administrators are particularly likely to favor their use: 82% of administrators say they favor the use of body cameras, compared with about two-thirds of sergeants (67%) and rank-and-file officers (65%). Half of officers say that wearing body cameras would make officers more likely to act appropriately when dealing with the public. But a similar share (44%) say that wearing a body camera would make no difference in the way officers interact with the public. Only 5% say wearing a body camera would make officers less likely to act appropriately. Black officers are considerably more likely than their white and Hispanic counterparts to say wearing body cameras would make officers act more appropriately. Roughly seven-in-ten (71%) black officers say this, compared with about half of white (46%) and Hispanic (53%) officers. Officers with higher ranks and more years of experience are also particularly likely to say that wearing body cameras would make officers more likely to act appropriately when dealing with the public. About seven-in-ten (69%) administrators say this, compared with roughly half of sergeants (53%) and rank-and-file officers (48%). And, while 57% officers with 20 or more years of experience say this, only 49% of those with 10 to 19 years of experience and 43% of officers with less than 10 years of experience agree. Among rank-and-file officers, these differences by years of experience remain. When asked about the effect of body cameras on the way the public interacts with police officers, only one-third of officers say that body cameras would make the public more likely to cooperate. Just over half (56%) say wearing body cameras would not make a difference in the way the public interacts with police officers. One-in-ten say that wearing body cameras would make members of the public less likely to cooperate with officers. Views on this differ significantly by rank: 52% of administrators say that wearing body cameras would make the public more likely to cooperate with officers. Smaller shares of sergeants (34%) and rank-and-file officers (32%) hold this view. Black officers are also more likely than white officers and Hispanic officers to say that wearing body cameras would make members of the public more likely to cooperate. Some 44% of black officers say this, compared with 31% of white officers and 33% of Hispanic officers. The survey asked police officers how much training they had in several key areas, which has been recommended to protect the public and police from encounters where unnecessary force is used. About half of rank-and-file officers – those who are assigned to a beat where they routinely interact with the public – say they have had at least four hours of firearms training involving shoot-don’t shoot scenarios (53%) and nonlethal methods to control a combative or threatening individual (50%) in the past 12 months. 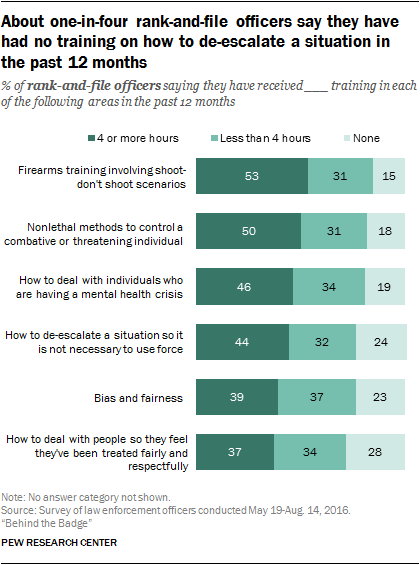 Some 46% of rank-and-file officers have had at least four hours of training in how to deal with individuals who are having a mental health crisis, and 44% say they have had at least four hours of training in how to de-escalate a situation so it is not necessary to use force. About four-in-ten rank-and-file officers say they have received at least four hours of training in bias and fairness (39%) and how to deal with people so they feel they’ve been treated fairly and respectfully (37%). Rank-and-file officers with less than five years of experience are more likely than those with more experience to say they have had these types of trainings in the past 12 months. For example, 63% of rank-and-file officers with less than five years of experience say they have had at least four hours of training in nonlethal methods to control a combative or threatening individual, compared with 47% of rank-and-file officers with five or more years of experience. 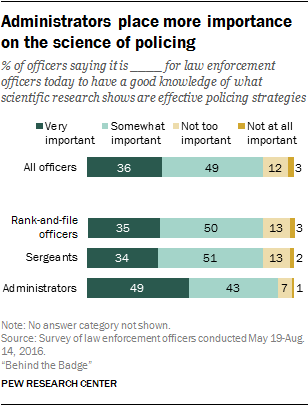 Some 36% of police officers say it is very important to have a good knowledge of what scientific research shows to be effective policing strategies. But high-ranking administrators are more likely than rank-and-file officers or sergeants to say this is the case. About half of administrators (49%) say it is very important, while 35% of rank-and-file officers and 34% of sergeants say the same. There are also differences along racial and ethnic lines. Some 44% of black officers and 46% of Hispanic officers say it is very important to have a good knowledge of scientific research on effective policing, compared with 32% of white officers. New officers (43%) are more likely than officers with five or more years of experience (35%) to say it is very important to have good knowledge of what scientific research shows to be effective policing strategies. Some police reform efforts are aimed at more subtle shifts in how the police interact with community members and where they focus their resources. A majority (65%) of officers say that today in policing it is very useful for departments to require officers to show respect, concern and fairness when dealing with the public – an approach referred to as procedural justice. Among those who view this as a very or somewhat useful strategy, 45% say that their department’s leadership gives a great deal of support to officers who want to do this. An additional 42% say their leadership gives a fair amount of support. About six-in-ten (58%) officers say that requiring officers to patrol more frequently in high-crime areas is very useful. This approach is called “hot spot” policing, because it concentrates policing efforts in the small areas where crime is concentrated. 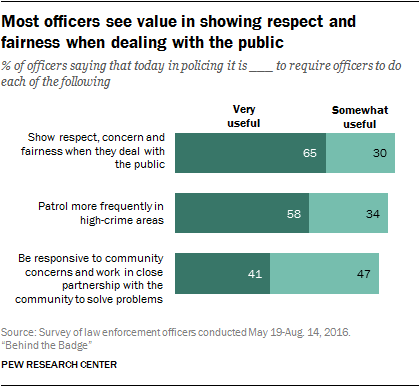 Among officers who view this as a useful approach, 32% say that their department’s leadership gives officers who want to patrol more frequently in high-crime areas a great deal of support. An additional 46% say the department’s leadership gives a fair amount of support. Fewer officers view the community policing approach as very useful today: About four-in-ten (41%) say that requiring officers to be responsive to community concerns and work in close partnership with the community to solve problems is very useful. Among officers who view this as a useful strategy, roughly three-in-ten (32%) officers say their department’s leadership gives a great deal of support to officers who want to do so. An additional 50% say their leadership gives a fair amount of support. About three-quarters (76%) of officers say that responding effectively to people who are having a mental health crisis is an important role of police officers, and an additional 12% say that it is a role of police officers but not an important one. About one-in-ten (11%) officers say this is not a role of police officers. 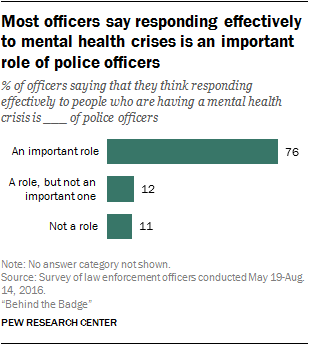 While majorities of officers across all demographic groups studied and agency characteristics say responding to mental health crises is an important role of police officers, those in larger department are less likely than officers in smaller department to say this is the case. About seven-in-ten (68%) officers in departments with at least 2,600 officers say responding effectively to people who are having a mental health crisis is an important role of police officers, compared with 83% among those in departments with fewer than 500 officers and 78% in departments with 500 to 2,599 officers. Officers are slightly more likely to say that local police should take an active role (52%) in identifying undocumented immigrants rather than leaving this task mainly to federal authorities (46%). White officers and those with more years of experience are more likely than their counterparts to say that local police should take an active role in identifying undocumented immigrants. About six-in-ten (59%) white officers say this, compared with 35% of black officers and 38% of Hispanic officers. And about six-in-ten (58%) officers with at least 20 years of experience say this, compared with 52% of those with 10 to 19 years of experience and 46% of those with less than 10 years of experience.